Berwick Fire Capt. Joel Barnes died while fighting a four-alarm fire on March 1.
irefighters from across New England lined up for Berwick Fire Capt. Joel Barnes' public memorial service Sunday at the Cross Insurance Arena in Portland, Maine. 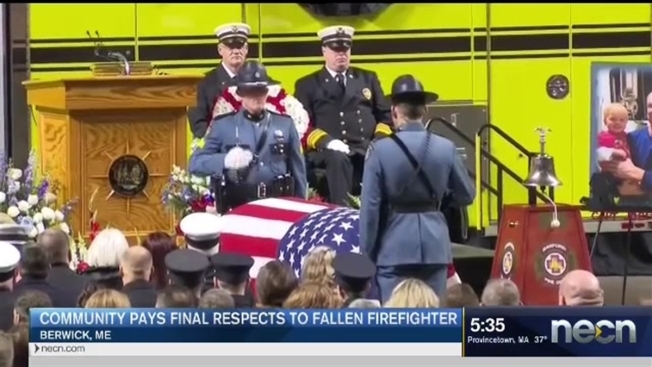 Maine is honoring the "ultimate sacrifice'' of a late firefighter who was fatally injured shielding a colleague while battling a four-alarm fire earlier this month. Firefighters from across New England lined up for Berwick Fire Capt. Joel Barnes' public memorial service Sunday at the Cross Insurance Arena in Portland, Maine. A private memorial service was held earlier Sunday. Barnes' uncle, also named Joel, grew teary as he described a nephew who grew up dedicated to serving the community as a firefighter. Berwick Fire Chief Dennis Plante said Barnes made the "ultimate sacrifice,' and had previously said Barnes protected a fellow firefighter from the flames and "died a hero." The 32-year-old Barnes was the first firefighter to die while battling a fire in nearly four decades in Maine. He died while fighting a four-alarm fire on March 1. Maine Gov. Janet Mills lowered flags to half-staff in the firefighter's honor. She says his life and service exemplified "unfaltering courage, selflessness and love for his fellow man." A funeral procession brought Barnes' coffin from the South Portland Central Fire Station, across the Casco Bay Bridge into Portland Sunday. 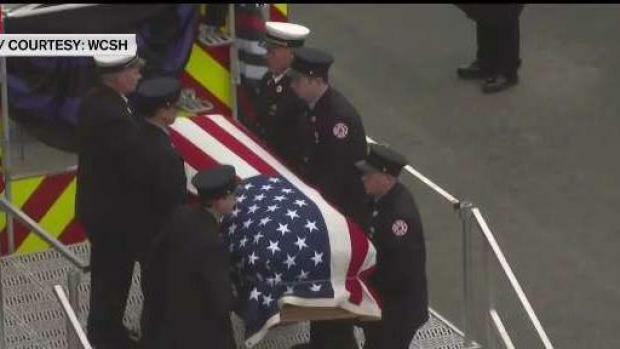 The coffin was mounted on top of the fire engine that the captain last rode upon prior to losing his life in the call of duty about 10 days ago. The procession will travel up High Street onto Spring Street and end at the Cross Insurance Arena. Approximately 3,000 firefighters from across New England and the country participated in the service to honor the fallen hero. One firefighter in attendance, Oxford Fire Chief Gary Sacco, suffered a medical emergency during the service and later died. Maine Governor Janet Mills confirmed the news, saying "The State of Maine has given two of its best to the Heavens."